Have you ever wondered why sinks ceramic are so resistant to breakages? Ceramic begins as a combination of clay and hardening materials that is then hardened in a clay oven before being glazed and put into a kiln. It is this process that makes ceramic kitchen sinks so durable, and also leaves them with a beautifully glossy sheen. Kitchen ceramic sinks are the perfect option for family homes as they are hardwearing and easy to clean. Any ceramic sink from our extensive collection will look fabulous in the modern home. HC supplies boast an incredible selection of designer ceramic kitchen sinks in an array of styles, making it easier for customers to find precisely what they want without being forced to trawl through several different sites. Discover curvaceous kitchen sinks in ceramic black from Astracast and enjoy paying less than the recommended retail price on our entire range of ceramic sinks. Purchase the most up to date designs from Ranemaster, such as the impressively modern, Rustique ceramic kitchen sink, or the classically traditional Belfast sink. Take your pick from our impressive range of ceramic sinks. Our ceramic sinks kitchen collection showcases ceramic sinks in white, beige and black, allowing you plenty of options. You may be looking for ceramic kitchen sinks that can be effortlessly added to your present fixtures and fittings, or you may want to completely refurbish your kitchen and be looking for inspiration. If your situation is the latter, and you live within 30 miles of our showroom, why not take advantage of our experience and expertise by employing a HC Supplies Designer? We can give your kitchen a complete overall at a discounted price. HC Supplies have been assisting people with their choice of ceramic sinks for some time and are renowned for providing the most modern ceramic kitchen sinks at the most affordable prices. Not only do we help people in the UK furnish their homes, but our overseas shipping options allow people outside the UK to take advantage of our fantastic offers too. Purchase quality ceramic kitchen sinks that will adorn your home for may years to come, whether you are in the UK or abroad. Our customer services team is here to assist in any way they can, so if you have any questions about shipping, products, or our design service simply give them a call. You can also contact us via the online form if you would prefer us to get in touch with you via email. We are happy to help you find your perfect ceramic kitchen sink, so why not get in touch? Do you prefer to see what you are purchasing in person? 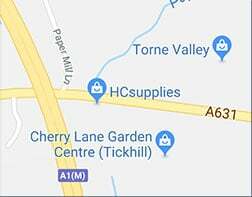 HC Supplies is more than just a fantastic online store, and our customers are invited to visit our showroom in Doncaster to peruse our sensational range of kitchen additions. Here you can see the quality of our ceramic kitchen sinks for yourself and also speak with one of our advisers about your precise requirements. If you would like to come and meet the team in person, find our details on the About Us page and pop in to see for yourself just how fabulous our range really is. Our discounts remain all year round, ensuring customers get the best deal whenever they choose to make their purchases. You can get over 50% off the recommended retail price on many of our products allowing you to refurbish your kitchen on a budget. Take your pick from iconic designers such as Astracast, Rangemaster and Bretton Park and marvel at the beauty of what used to be considered a mundane household object. Embrace the opportunity to bring something truly unique into your home with an Astracast Onyx Gloss Black sink, or the Rangemaster Nevada ceramic kitchen sink. Should you need help with selecting the ideal ceramic kitchen sink for your home, or you require further information about any of our products, contact our support team today. We are here to ensure you are delighted with your purchase and therefore if you have any questions regarding any of our items after you have purchased them we are happy to help.